Yesterday, in a joint statement, the NAACP, the National Council of La Raza, Faithful America, GLAAD, the Human Rights Campaign, People For the American Way, and the Southern Poverty Law Center publicly urged Louisiana Governor Bobby Jindal to cancel his scheduled appearance at the upcoming Values Voters Summit. Hours later, Jindal’s spokesman Kyle Plotkin announced that he was bowing out of the event, citing a scheduling conflict. A coalition of human rights groups is calling on members of Congress and other public officials not to speak at the upcoming Values Voter Summit in Washington, D.C., because the event host and its key co-sponsor – the Family Research Council (FRC) and the American Family Association (AFA) – have long records of vilifying the LGBT community and spreading other forms of bigotry. The coalition letter was signed by the NAACP, the National Council of La Raza, Faithful America, GLAAD, the Human Rights Campaign, People For the American Way, and the Southern Poverty Law Center. The letter also points out that Bryan Fischer, AFA spokesman and director of issue analysis, has blamed gay men for the Holocaust and the Nazi Party. “Homosexuality gave us Adolph Hitler, and homosexuals in the military gave us the Brown Shirts, the Nazi war machine and 6 million dead Jews,” Fischer has written. Fischer and the AFA’s bigotry are not limited to the LGBT community. Fischer has said that African Americans “rut like rabbits” and argued that women should be kicked out of politics and the military. He’s also stated that Hispanics are “socialists by nature” and come here to “plunder” our country. Standing in front of a Confederate flag, Perkins once addressed a group that had described black people as “a retrograde species of humanity.” His speech came two years after the Republican National Committee urged public officials to shun the group because of its bigotry. The coalition letter urges public officials invited to speak at FRC/AFA event “to not lend the prestige of [their] office to the summit,” which begins Friday. The public officials invited to speak include Gov. Bobby Jindal, Sens. Rand Paul, Marco Rubio, Ted Cruz, and Tim Scott, and Reps. Paul Ryan, Randy Forbes, Michele Bachmann, Jim Bridenstine, Louie Gohmert, Jim Jordan, Steve King, Steve Scalise, and Scott Turner. Governor Jindal is currently traveling out-of-state, and he remains listed on the Values Voter Summit’s official schedule. His spokesperson did not indicate what, exactly, created the sudden conflict in Governor Jindal’s schedule. Jindal, to be fair, was the only speaker listed who had not yet confirmed his attendance, although his name still appears. More than likely, Jindal’s decision to skip on this particular event was made easier, not only due to the significant and legitimate pressure from outside civil rights organizations, but because of the proliferation of stories concerning Tony Perkins’s recent moves in Louisiana. In April, Governor Jindal appointed Perkins to the Louisiana Law Enforcement Commission, and once Perkins’s appointment was finally reported, months later, Perkins embarrassingly and stunningly revealed that Jindal had appointed him to defeat “the homosexual agenda” in Louisiana and to recommend law enforcement dedicate resources to investigating the Southern Poverty Law Center. A week later, during an awards banquet for the Louisiana Family Forum, Tony Perkins told two well-placed journalists that he was thinking about running for Congress. Jindal may not admit it, but his cancelation certainly suggests a reluctance to share the national stage with the volatile Perkins, and perhaps more importantly, it distances himself from the least popular and most divisive elected officials in the country. For Jindal, that’s a wise political decision. 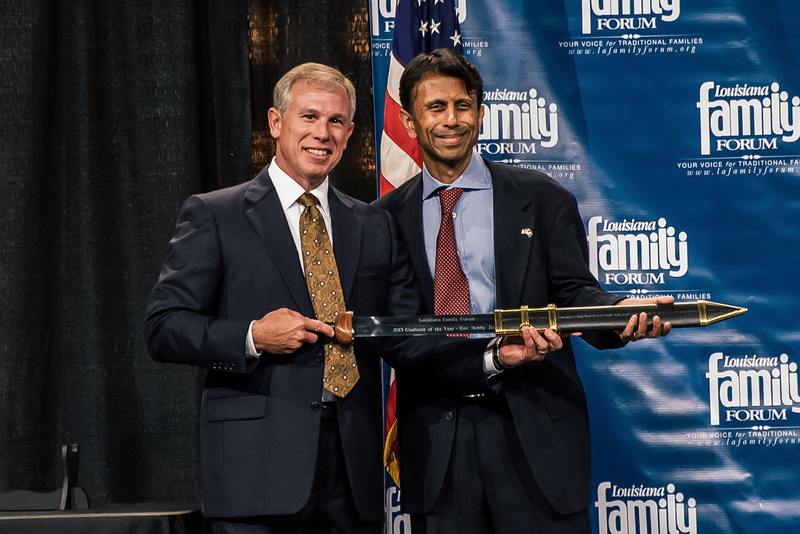 I don’t ordinarily do this, but kudos to Governor Jindal. The fact that he actually thought it was a good idea to speak there at all speaks volumes. Clueless! Living in the DC area, nothing makes me happier than saying I’m going out of town this weekend. What a terrifying collection of speakers, including Craig James who is listed as a “College Football Analyst.” They forgot “Failed” and “Ex-“, two modifiers that could also be used before “US Senatorial Candidate.” Loon. It appears that Piyush Jindal no longer feels invincible. Ahh, poor poor man, when reality begins to rush into the void left behind by his delusional presidential hopes, the pain to his psyche will be considerable. Too late for our state of course. He has already destroyed the greater part of our social services, but we can hope that he will impotently retreat to a corner and whimper until his term is up.